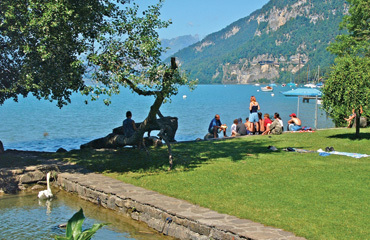 You will find 5 holiday parks in Switzerland with static caravans, park homes and lodges to rent. There are many types of holiday parcs in Switzerland. Our directory includes parks with diverse locations and facilities. If you are looking for parks in forests, near lakes or on elsewhere in Switzerland then there are many parks to choose from. 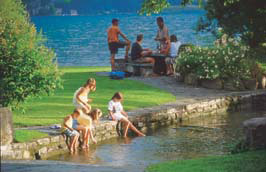 There are quiet holiday parks in Switzerland, small parks with a few facilities to bigger holiday parks offering a wide range of activities and something for the whole family. Manor Farm is located in the Swiss Alps area of Switzerland. Manor Farm is an ideal base for touring the gorgeous Swiss Alps, with fantastic scenery all around and plenty for the family to do within the parc itself. In a beautiful setting, with superb views of the surrounding mountains, Manor Farm is an immaculate and typically well-run parc. View holiday parks in the Swiss Alps area. Bella Tola - Eurocamp is located in the Valais area of Switzerland. Surrounded by snow-capped peaks, Bella Tolla is a beautiful base from which to discover Switzerland. Bella Tola is a lovely parc enjoying a magnificent situation on a wooded hillside ringed by the towering mountains of the Valais region. 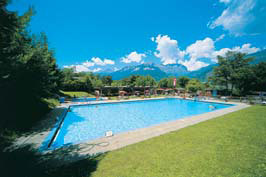 View holiday parks in the Valais area. Camping Jungfrau is located in the Espace area of Switzerland. Enjoying one of the most spectacular locations in Europe, Jungfrau puts the Swiss mountains on your doorstep. Camping Jungfrau has a quite exceptional setting, nestled in an immaculate valley of lush greenery and shimmering waterfalls, surrounded by snowcapped peaks. View holiday parks in the Espace area. Camping Manor Farm is located in the Berner Oberland area of Switzerland. Camping Manor Farm is a long time Canvas favourite. Awarded the highest Swiss rating, this south facing campsite is surrounded by mountains with views towards the Eiger. The lakeside setting and private beach make this a natural watersports centre where you can fish, windsurf or canoe, and the hardy swim all year! 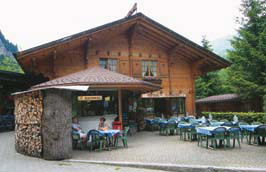 View holiday parks in the Berner Oberland area. Campsite Ewil is located in the Swiss plateau area of Switzerland. View holiday parks in the Swiss plateau area.